So I finally developed a kick serve - I mean a proper one and not a dinky one. I tried out doing both 1st and 2nd as Kick serves. the consistency was amazing. I mean I did not have to do a lot of 2nd serves. Some of the serves has so much action that it went past the returner even before he could prepare his racket. He was surprised to say the least. By kick serve I mean both topspin and american twist. I can do both now. Now that I kept doing kick serve, I realised how difficult it is get the percentage up when doing flat. I mean I was double fault machine. And now I'm winning 40-0 40-15 easily. I was not feeling tired or anything even after doing so many kick serves. All this time I stayed away from kicks believing from videos and people that it is a really hard serve. But it is not. Once you understand the principle behind it, it is all about conviction and going for the full motion being loose. Anyway, do any of you do kick serves both as 1st and 2nd? What are the drawbacks? The advantage is consistency and no pressure as you don't miss the first serves a lot. One drawback is don't get locked in on not mixing it up, move it around the box. You can take it to the point of 100% effort and 60%, many times the 60% are miss hit returned due to timing errors where the 90% ones come back as winner returns. i used to... when playing in the 4.0's... especially when my first serve (flat or slice) was crap, and my kicker wasn't consistent (ie. 95% to get either first or second serve, but only like 60% if i only get 1 serve in - at the location i want). and often the kicker to the bh was enough to start the point in my favor. * folks at 4.5 have much better bh's, and can often neutralize it after the first set or so... at 4.5+, especially taller folks, can return a kicker to the 2hbh with interest... so you have to keep them guessing. that said, if i'm s&v'ign i'll kick almost exclusively, just to give me to time to get to net. I do it more lately, because im building my kick serve and making it a consistent weapon (not only a consistent shot), so currently I often hit 2 kicks. But generally no, best to hit 1st serve in most situations then a kick (if your kick is 99% consistent and good), because with a kick for 1st serve you win less points, with a 1st serve u make alot more errors and aces and win more points, and then you always have the kick for the 2nd if you need it (as far as its 99% consistent), now if your kick is not consistent at all, then it does make sense, because the advantage u get from 1st serve and winning more points is negated by the fact that u make more double faults. i do think the slice serve is way easier on the body... doesn't require as much leg drive to be effective (ie. you can "arm" it, and still be effective)... but does cost you some consistency since you don't have the clearance of a topspin or kick serve. and if you're like me, alot of people accidently bend their back a bit on an errant toss too far over the left side of my body. All depends on the return of the opponent. If they don't move well/fast I probably will use more pace and mix between center and outside. If they just have questionable ROS racquet technique I'll serve kicks all day and move them around a bit, which also uses less effort and less wear on the shoulder. My hard/flat is maybe 95 anymore tops, so I need to do something more with serves to beat better players, so kick and placement mix in well. That's a very good idea. I did not try that. I don't know about slice. My arm hurts when I try it (the way Salzenstein teaches it) i.e. finish with palm up and racket face up. Not learned the pronation on slice yet. After seeing the consistency on kick, I hate flats now. When you get those serves in with kick and power, the other aspects of your game improves as well. I guess that's what it does to your confidence. One thing I realised that to get a proper kick is to go up with your body up (unbend your knees not jumping though) before going forward with the body. It is difficult to explain but once I got it I knew I was on to something. You realize that this isn't an either/or thing right? You can hit a serve halfway between a flat and a kick? I have a spin serve motion that I do for all my serves. It really depends on my toss and slight grip adjustment. I'll usually start my service with a good 2nd serve top/slice serve. I typically hit to BH. I'll hit the same serve to them the next time. If I see him a third time, I'll do more slice and less top and go wide FH. Next service game, I'll start the same way. But the 2nd time I see them, I'll go for a kicker or top/slice body serve. As I get my confidence up, I'll go for a flatter power top. Even if I miss, I want them to have that in their head that I might get one in so they don't anticipate timing a big loopy spin serve. I don't have dominating pace serves, but I keep the returner guessing and on their toes. If they dial in everything, I may back off on my 1st serve and land it short. Basically try to keep them from getting the timing down on my serve. All I am going for is for them to not light up the ROS and hopefully slightly miss hit it to go out or an easy play for my net person. I've found this to be effective up to 4.0 level. It irks me a little bit when some folks over-complicate the slice serve and recommend unnatural movements to hit it. When I teach the slice serve, I keep it simple and encourage only a couple of adjustments to a flat serve motion. One adjustment is to simply go about a half-bevel further toward a backhand grip. If you hit a flat serve with a true continental grip, move it just a little toward backhand, but not so far that you've gone all the way over to eastern backhand. When you swing the same as with your flat serve, this grip change will introduce a little angle on your racquet face at contact that's needed to make the sidespin for a slice serve. The other adjustment is to change your aim to compensate for that angled racquet face. If you're a righty, change your general aim by about 6 or 8 feet to the right of where you'd aim your flat serve. We have to do this because the angled racquet face will naturally send the ball more to the left. You might accomplish this by only tossing the ball slightly more to your right, but it might be more comfortable if you also close your stance a little bit, too. A left-handed server can make the same alteration, but just aim more to the left. With those two adjustment done, toss the ball and swing through it just the same as you swing through the ball for your flat serve. No slowing down your swing to steer the ball and no torquing your wrist over the top to some uncomfortable finish. A loose and comfortable flat-serve motion is just fine for also producing a slice serve. Repetition will build your instincts for hitting the slice serve with better placement. It should seem strange at first because you're essentially using your "flat swing" to make the ball curve instead of fly relatively straight. Practice will build a consistent move and a more predictable ball flight. Exactly - I put some spin on every serve, even the flat one gets a little spin. Edberg did something similar (his 1st had a bit more on it than his 2nd, but definitely not flat). Wilander also did something similar in the 1988 FO final against Leconte. 97% of 1st serves in!?! I've been doing a kick serve for both this past month and in doubles it works well setting up my partner at the net. In singles against most players it just kind of gets the point started. Against better players (4.5 and above) they can put me on the defensive and against them I'm better off with slice or a flat serve. There are some people that have more trouble returning the kick than my regular 1st. So I think if you don't mind not hitting many aces or unretrunable serves it can ok, but mixing in a flat or slice would probably help if you feel comfortable doing it. Some posters have said about topspin on flat serve. How do you put topspin on flat serve? I mean when you toss out far in front to do a flat, I struggle to understand how you can put topspin without tossing directly your head or a little further behind. Vince Spadea says always toss at 12 o clock i.e. over your head and you can do any serve. Topspin yes with that toss but flat? I will try that. I guess what you're saying is just go mid way between eastern backhand grip and continental and do the same motion as flat. Toss also the same? How? How do you put spin on a toss that is so far out in front i.e. flat? I wish I had that much variety and consistency. The only consistency I get is when I serve kicks. The others usually go long - maybe because I do not understand how to put spin on other type of serves. If you toss the ball high, just hit up to the ball, or like Pat Dougherty would say: Hit up the mountain. Dont hit down on the ball, hit up and put some spin on the ball, that goes for every serve type. Gravity and spin will take the ball down into the service box. I will try next time I toss out in front. It is natural to hit up with topspin when you toss over your hear but not when you toss out in front. One question - do you remain sideways using shoulder over shoulder only for this? Or do you face the net more? One of the best serve video I have seen is by Pat Dougherty, you can email him and buy the video (about 1 1/2 hour) direct for I think about 25 USD, he will explain your question far better than I can ever do. Some posters have said about topspin on flat serve. 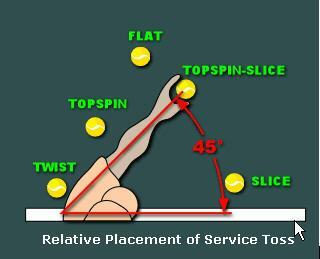 How do you put topspin on flat serve? Sampras averaged something like 2500 rpm on his 1st serve, and double that on his 2nd serve (Yandall would have the exact stats). Hit the middle of the back of the ball, and go over the top. Correct in terms of the grip change and the same motion for a flat serve. But the toss location has to work in sync with the angled racquet face. If you toss in the same spot and swing through the same path as with your flat serve, but also hit the ball with the different grip and angled racquet face, the ball will probably go more to the left and miss wide. So to change your aim to the right, you might be comfortable with keeping everything the same with your setup, but just tossing slightly more to the right so that your swing path can go through the ball a little more to the right. Some servers may not be comfortable with altering only the swing path of their arm while everything else remains "pointed" in the original direction that worked for a flat serve. So it might feel better tossing a little more to the right and also aligning your stance and body a little more to the right at address so that you can comfortably swing through the ball in the exact same way as with your flat serve. After a righty changes from a flat serve grip to a slice serve grip, that mild realignment of everything might feel like that server is set up to hit a flat serve straight ahead toward the ad court service box, but the slice serve grip will make the ball angle off to the left and effectively send that slice serve toward the deuce box. This gets back to my simple image of "hitting a flat serve with an angled racquet face" to hit that slice serve. You can focus on placement then. Try hitting the corners and also one that moves towards the body. Read how your opponent is playing and make it difficult for them. When I was working on my kick serve, I noticed that my toss was a bit inconsistent. That varied the action of the ball. But because my serve motion was consistent, the ball would go in. I was inadvertently "mixing up" my serves. I've ROS'd some great kicker serves. But after seeing it a few times, if there is no variety of placement or movement, I'm able to get the timing down. I have noticed that the biggest trouble I have returning a serve is with serves that have a nasty spin rather than pace. This invariably happens when I play against advanced players. These guys can hit so much spinny serves that the ball just bounces off my racket in a mad uncontrollable way. I hate dealing with that spin. Also, some returners love pace, which is a double negative for me: not only do they hit better returns off of my flat serve, I also have less time to get to the net. In those cases, kicks do nicely. I haven't been able to beat many high 4.5s with my S&V, though; their returns are a bit [sometimes more than a bit] better than my net game. So I'm working on developing my flat serve too. Tonight I hit probably 70% kicks. 1st and 2nds and came in behind most. Its just more time to get to the net and its actually harder to return than flat serves for most returners. Its a good play if it works and you can get weak replies. Draw back is if you are predictable. Ok the exception is if you can hit the really wide ad serve. Even if they know its coming its hard to attack for most players if you mix up the spins. Hard and slower ones are a must as well as height. Another draw back is the trajectory makes it tougher to hit some locations. You need a brush off pitch. Example that guy who camps out in the ad doubles alley to crush a fh. If you try to kick down the T especially if you have some twist, its not much of a brush off pitch in that it is moving into the returner. So even if you fool them its easier than a slice to return in that instance. Because of its height of bounce the returner can hit down on the ball and if you are coming in you might find more shoestring volleys are in your future. Its a slight disadvantage over the slice if you are playing that 6'3" giant guy and it bounces in his wheelhouse where the slice stays low. To verify a kick serve technique you need high speed video feedback or clear results in the ball's trajectory and a bounce to the side (To the right for a right handed server.) You can use feedback from a well qualified instructor, high speed video feedback or feedback from the ball's trajectory as you serve. If something goes wrong high speed video can show it. The reference book Technical Tennis by Rod Cross and Lindsay? has excellent illustrations on the contact points of the racket on the ball to give various spins. That first spot cannot be observed directly with most high speed video. But the first touch location of the racket face on the ball is determined entirely by the angle on the racket, a plane meeting a sphere. There are ball and string distortions, squishing, during impact so it is best to look at the racket face angle just before it touches the ball. Behind Camera View Kick Serve. This Toly gif has one frame before impact, one during and one after. Measure the angle between the forearm and racket with a protractor. This angle is smaller for the kick serve than for the slice ot flat serves. This server's chest faces more to the side than for the slice or kick serves. From this camera view, the arm is held more vertically using uppermost body orientation for the kick serve than for the slice or flat serves. The racket rises more after impact for the kick serve than for the slice or flat serves. Behind Camera View Slice Serve. Toly gif with one frame before impact, one during and one after. Measure the angle between the forehand and racket with a protractor. The racket head does not rise much after impact. The arm is tilted to the right, farther from the vertical than the kick serve, as seen from this camera view. In the serves above the kick serve was impacted lower (use net as reference) so that the racket was still rising during impact. There is a similar upward racket motion involving internal shoulder rotation (ISR) for the kick, slice and flat serves. The racket rises for all three type serves. But for the kick serve the ball is impacted before the racket is near its peak height. The time of impact is maybe 5 milliseconds earlier for the kick serve than for the flat or slice serves. Compare the racket rise after impact in the gifs. Rare Fuzzy Yellow Balls overhead videos processed by Toly into composite pictures. 1) Slice - 70 d. racket head rotation. 2) Flat - 82 d. racket head rotation. 3) Kick - 54 d. racket head rotation. Note - racket rotation probably began before the first frame shown in the pictures. Side Camera View Kick Serve. As seen from the side of the ball's trajectory the racket for the kick serve is closed just before impact more than the for the slice and flat serves. If you want video feedback for the kick serve high speed video is necessary to observe the racket head orientation just before impact.